Sometimes, your personal appearance could use a bit of shaking up. A piercing is often a great way to do that. Whether you’re getting your ears pierced for the first time or you’re going for a bolder nose piercing—or anything in between—Michigan’s got plenty of options. Here are our favorite piercing places in Michigan. Screaming Needle Tattoo boasts three locations throughout West Michigan, including Allendale, Grand Rapids, and Wyoming. 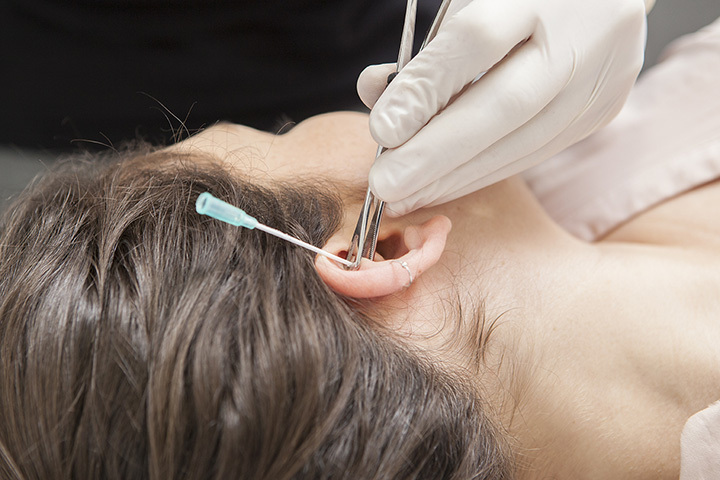 Safety is a primary concern at Screaming Needle, as demonstrated by the company's use of autoclave sterilization of equipment as a finishing step. Yes, autoclave is actually just part of the process, not the whole process. Using surgical-grade steel and titanium, Screaming Needle takes quality seriously as well, and even offers customized gift cards for those who want to give the gift of a piercing. Regarded by locals as the “premiere destination for piercings,” Williamsburg's Straight Through Body Piercing delivers top-notch service. Featuring stainless-steel piercings and a clear devotion to cleanliness in the shop, it's the kind of place where you could comfortably take your daughter for her first ear piercing. That's made clear by the fact that several customers already have done just that. Pincushn's more than delivers with steady hours—they're open noon to 8 p.m. every day except Sunday—and they offer up a complete primer on aftercare that helps to make sure your piercing goes as well as it might. This is a wonderful place to go for your first piercing. West Bloomfield's Chroma Tattoo delivers several options for piercings, with head, facial, and body piercings all available. Not only do they have medical implant-grade surgical steel and titanium available, but they'll also even offer medical-implant grade niobium, which is something not seen all that often. It's even all internally-threaded for extra safety, making it clear that Chroma Tattoo has your best interests at heart. It's a pretty elaborate name, but Muskegon Electric Coil Tattoo and Body Piercing is a pretty elaborate shop. Located in Muskegon, which you pretty much figured out from the name, Muskegon Electric Coil prides itself on cleanliness and the range of its piercing options. Daith piercing, for example, is on hand here—for those who don't know it's the piercing of the innermost cartilage fold of the ear—as is septum piercing. It's even possible to get botched piercings fixed here, in some cases, which is likely welcome news. A Saginaw fixture since 1993, Holeybody Piercing has been offering up high-end body piercing services for a quarter-century. As part of the Association of Professional Piercers, Holeybody seeks to offer up the best services in keeping with the Association's standards. Cassette autoclave sterilization and implant-grade jewelry helps ensure that Holeybody's work is about the best it can be, while still allowing its patrons room for creativity. Troy's Iron Clad Tattoo features a terrific range of options. Whether you're looking for variety in where your piercing goes—ears, nose, navel, and beyond are all covered herein—or in the kind of jewelry, you'll find yourself covered at Iron Clad Tattoo. With jewelry options including titanium and niobium along with 14-karat gold, this upscale shop looks to provide rock star-level service even if you don't happen to be one. Head out to Midland to check out Black Ball Tattoo, where Maggie will be on hand to handle your piercing needs. If you're between 16 and 18, you'll need to bring a photo ID, a birth certificate, and a parent (whose name is on said birth certificate) to get any work done therein. From there, you'll have a range of options, including most any piercing above the belt, as well as microdermals, which start at $60. AWOL Custom Tattooing makes a particular point of being three things: safe, clean, and reliable. That's exactly what you want to see in your piercing operations. At AWOL, they use only implant-grade surgical stainless steel or 6ALV-ELI ASTM F-136-02 titanium. The piercer handling the functions there has also been pretty extensively trained, and knows exactly where to place a piercing for the best and cleanest healing. Eric, one of their piercers, even has a portfolio you can check out for added peace of mind.